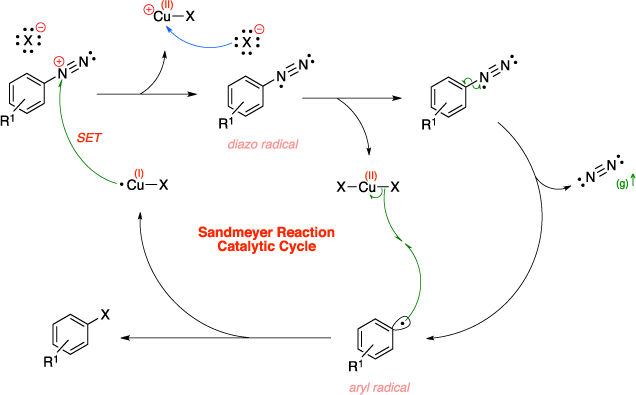 The Sandmeyer reaction is an organic reaction used to convert an aryl diazonium salt to an aryl halide using a copper(I) halide catalyst. The mechanism begins with a single electron transfer (SET) from the copper to the diazonium to form a neutral diaso radical and copper(II) halide. The diazo radical then releases a molecule of nitrogen gas to form an aryl radical. The aryl radical reacts with the copper(II) halide to regenerate the copper(I) halide catalyst and yield the final aryl halide product. Sandmeyer, T. Ber. Dtsch. Chem. Ges. 1884, 17, 1633–1635. Sandmeyer, T. Ber. Dtsch. Chem. Ges. 1884, 17, 2650–2653.